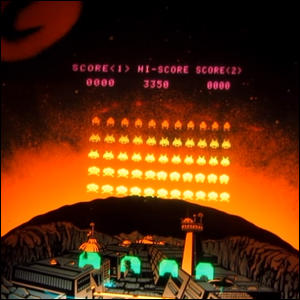 The Screen Of Space Invaders Was Colored By What? The Colors Of The Rainbow Were Identified And Set As They Are Now By? The earliest release of Space Invaders was a cocktail-table version and only came in black and white. By the time the arcade classic made the jump from Japan to the United States, it was redesigned into an upright arcade cabinet; part of that transformation included adding color to the display. Because color displays were expensive and the original game didn’t actually support color codes, U.S. designers at Midway Games got creative. In order to add more eye appeal to the simplistic game, they opted to use a mirror-bounce display. The CRT monitor was actually in the cabinet behind the game controls and faced straight up towards the ceiling where the currently displayed visuals were reflected off of a mirror towards a painted backdrop to increase the depth of gameplay. In addition, colored cellophane was layered over the CRT monitor’s screen, creating the illusion of color (in this case green and orange). The combination of the painted backdrop and cellophane made it possible to display graphics the game computer itself was not capable of creating. In the image above, you can see how the CRT monitor’s output was not only colored (with bands of green, yellow, orange, and pink cellophane with this particular model), but also reflected onto a painting of a city against a fiery sky. It would be well over a decade after the release of Space Invaders before arcade games could even come close to replicating the painted backgrounds early editions of the game were enhanced with. The clever design choice was a hit and distinguished the game. By the end of Space Invaders’ production run, both the U.S. and Japanese cabinets used the cellophane and painted backdrop mirror-bounce display trick.